On this page, Bethany Abrahamson from InTheKnow Tarot LLC conducts an interview with Kay Cook, an English spiritualist medium living in Reykjavik, Iceland. When I visited Reykjavik last October, I had the privilege of meeting Kay Cook, a spiritualist medium and professional rune and energy reader from England who now lives in Iceland. Kay gave me an excellent reading while I was in town. I enjoyed our session so much, I decided I wanted to interview her, and luckily Kay agreed! Her background and expertise is quite fascinating. I'm delighted to feature her, and I hope you enjoy learning about her as much as I have. How did you begin your journey into mediumship? What led you to pursue it as a career? I cannot say there was a magic moment when I thought, " I could be a medium". It just seems that a tide of events took me in this direction. Growing up I was very intuitive, paricularly sensing atmospheres, occasionally I sensed things which were going to happen. When I was older I realised that from time to time I had been aware of my mother´s grandmother, Rosina, when I was younger. I had thought of her as an imaginary friend until, aged 14, I became more aware of spiritualism. For a couple of years I went to services with my mother, before we drifted away. During my twenties my intuition strengthened. I bought my first sent of runes in 1983, but did not take them out of their wrapper until around 1990. My capacities as a medium began to develop in my late twenties, and my intuition, also, became something I could use to read for other people. During her final illness in 1993, my mother gave me a great deal of encouragement to work with the public, which I began to do. At the time my readings included mediumship and intuition. When I was with like-minded friends I used my runes, unlike tarot cards, they were not something people in the UK understood at that time. In 1994, I went back to the Spiritualist Church and was trained to work on their platforms. I wondered if I would be too shy for this kind of public work. In the end it gave me confidence, which was a wonderful gift. I still go back to England to work in their Spiritualist Churches and to give readings at various other venues. This work is the most important part of my life but I have most of the time combined my mediumship work with other work. I am also a qualified hypnotherapist, and I have often taken on other part-time work projects too. At the moment, part of my working week is spent writing text for the website of a local adventure travel company. Writing and Iceland come equal second when it comes to my greatest loves, so this is fabulous for me. What inspired you to learn runes? I always say the runes found me. I first discovered them when I went with my then husband to the Elephant Fayre in Cornwall in 1983. My husband was interested in classic cars and a meeting of the local group took place at this Fayre. There was a lot going on, music, stalls with crafts and many things which were considered to be alternative. Classic cars were not my interest so I wandered around looking at everything else. I got into conversation with a lady selling, among other things, Runes. She offered me a taster 3 rune reading which was accurate and fascinated me. I then bought my first set of runes then put them away and forgot about them. My spiritual gifts became a lot stronger around 1990, and if there was a catalyst it was this. I started to work with them from time to time. To begin with I did readings for myself and wrote them down, over a few years I meditated with them and extended the meanings I had learnt from the info which came with my Runes. I practiced a lot with like-minded friends as the years went on. Not many people were open to the Runes at that time, later on a discovered a fabulous rune master at Glastonbury England, he gave me a lot of encouragement to work with the runes in a public way. There was no great poetic moment of realization, just a progression! What do you strive to provide and achieve with your clients during a reading? In all readings there is the wish to achieve upliftment and encouragement, the client should feel better than when they came in. Otherwise, it would depend upon the kind of reading the client has requested. For example, I offer pure mediumship readings. When I work in English Spiritualist Churches, these are the only readings I am permitted to provide. The aim here is to provide evidence of survival and an uplifting or encouraging message. Sometimes, particularly when I am working with recently bereaved people, there can be a few healing tears, other times just pure joy. The messages always refer to the recipient’s own situation, and clients usually receive some extra options for understanding that situation, with greater clarity and self-understanding. The spirit people can give us a lot of ideas but really they come to say “I love you”, “I still take an interest in your life and I care”. Often they share fun or precious memories from the past, and often there are cryptic messages within the memories they bring and the aspects of their personalities that they choose to share. There will be a relevance within these things to the life of the recipient. Most of my private readings outside of English Spiritualist Churches are combined readings, so we have evidence of survival from a couple of spirit communicators and messages. Sometimes the messages will concern future developments within present situations – I pass these on but point out the recipient always has personal responsibility. I then work with the Runes for life and self-understanding, the goal being to see present situations and how the client fits into these, and to look at the highest potential possibilities, what can the client do to help themselves get the most out of life at this time. In a combined and general reading of this type, I will also look at their soul pathway as it is developing in the coming months. What are the life lessons which are uppermost? In a combined reading, I will intuitively link with a chakra of my client to fine tune the meaning of a Rune, I then link with the incoming universal energies to get a more personal view on the future potential represented by that Rune. In a combined reading, I do not do this with all of the Runes, just a couple where I feel it is particularly important. Clients also get the opportunity to select three more Runes to drill down into an area of their life which they would like to know more about. For example, a business idea they have, or a friendship they would like to breathe new life into. A reading can also bring ideas for moving on when certain aspects of our lives have run their course. It is my goal that these clients leave with fresh insight, self-understanding and ideas to work with. A reading cannot solve every problem or be expected to find a way resolve things in exactly the way the client wishes, and clients have responsibility for making their own choices. I always highlight areas of choice which show up in a reading. These are often where the greatest opportunities come in, although strokes of destiny play their part as well. Of course, the goal people have for their reading can make a difference, and sometimes I work with the Runes and the energies in a life coaching way, when we look in an inspiring way at the things the client can bring the greatest positive changes to. Sometimes I do soul readings, and my goal here is for the client to leave with a better understanding of their own soul lessons, their soul pathway and of the flow between their soul and the outer world. You've written a book. Congratulations! What is it about, and what inspired its creation? I wrote Runes and Rainbows to share my way of working in an integrated way with the Runes, Chakras and Energies. If people are only interested in learning to read the Runes they can do exactly that, adding in the layer of using the chakras can only be done after the Runes have been learned. The layer of the chakras does not change the meaning of any Rune, it helps me to know more about the aspect of life it relates to with the particular person I am working with. The layer of the universal energies tells me how the incoming energies are encouraging and supporting the future potential which a particular Rune indicates. The way I work, there is no specific chakra for a specific Rune, the chakra and the universal energies I work with in relation to a Rune are something I sense intuitively. Thus, each Rune will have different chakra and energetic links because these relate solely to the person I am working with. I explain how I interpret information gleaned from the chakras and the universal energies in an easy to use way. There is also a section on intuition and soul projects and their development. I wrote it very much from the perspective of a medium who works with the Runes, rather than someone who is steeped in Norse mythology, although I am certainly interested in Norse history and mythology. I have always loved writing, I took my first creative writing class in around 1987, at that time I concentrated on writing poems for publication and also a few short stories. I also used my love of words and writing to help with community projects, for example, writing letters for groups or clubs I was involved with. I always felt there was a factual book in me, even in the late 1980s. I also felt I would write my biography one day but could not think why my story would be sufficiently interesting that anyone would want to read it! I still feel there needs to be more water under my bridge of life before I write my biography, although I have shared some of my experiences in my book, Runes and Rainbows. Looking back, I am surprised I didn´t write Runes and Rainbows earlier than I did. I had always kept notebooks over the years. People asked me about the way I worked, how did I combine the Runes with my understanding of chakras and universal energies. Did I work to a system? This was a question which was asked with increasing frequency. It just seemed natural to put all my info and experience together and write Runes and Rainbows, beginning in the latter half of 2013. I am currently taking a break from writing a novel with a spiritual background, which is mostly set in Iceland. Whether I ever finish it I don´t know, but I would like to! Do you have advice you'd like to give to aspiring intuitive professionals? My number 1 tip is to take your time! Unless, of course, you have been doing readings for a long time and friends of friends keep recommending you to others, who then come back and also recommend you to yet more people. Although, this is never quite the same as working with members of the public who may have a poor understanding of what a reading is, or what it can achieve, or are more demanding because they have paid money. Training courses are good but you need to practice, practice and practice some more, and to also practice with people who are outside of your own friendship or study group. With mediumship, the extra training I had for platform presentation in the Spiritualist Church was invaluable, assisting my confidence with private appointments also. It is important that you want to be of service to those who come to you but you must be able to set ethical guidelines for yourself as well. If you are earning your living this way, you have to feel it is okay to ask a reasonable price for what you do. You have to be okay with saying no sometimes, particularly if it becomes clear that the potential customer has expectations that you cannot/or it would not be reasonable or ethical to fulfil. It is important to look after yourself. I have been asked to do readings late in the evening, which would be a strain for me, as I am not a night bird! You need to make sure you give yourself time off and create balance in your life. Most people are lovely to work with but there are a few who will try to pull upon you whenever they have a slight problem in their life. If you cannot handle this by creating boundaries in as compassionate a way as you can, you would become drained by such people. I draw the analogy of two nurses, both equally compassionate. Each nurse does their utmost for their patients, however, one nurse goes home and gets on with life, the other nurse spends excessive time thinking about their patients. We all know the nurse who separates work from life has more joy and balance in their life, those of us who do readings professionally should strive to balance work, rest, play and social life. You work with people but you need a social life outside of work, so you need to think how you will achieve that. Doing readings professionally full or part-time is not for everyone. Even if people tell you your gift is there for a reason and you should use it, I firmly believe the medium/reader is the only person who can say whether this is right for them. Some like or even need the balance that a full or part time job brings to their life. I know of excellent readers who have other full-time careers who work professionally a little in their spare time, and others only work to raise money for charity. Whether we are spiritually gifted or not we should decide what works best for us. It is, though, nice to have the option of doing readings full-time if one wants to. Thank you so much for your time, Kay! I enjoyed your responses and learning more about your professional background and projects. If you are interested in learning more about Kay, please visit her website. She performs in-person readings in Reykjavik, and also delivers readings via post, email, and Skype. I highly recommend her services, and look forward to booking another session with her again! 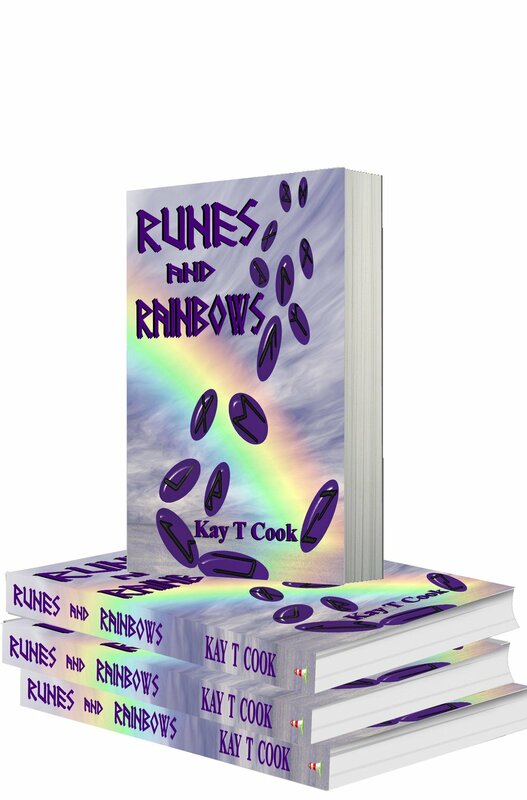 For more information on Kay's book "Runes and Rainbows," please visit her author website. Kay was also interviewed by Radio Iceland. It's really interesting. Check it out!